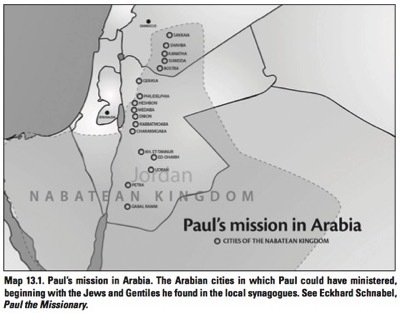 Paul in Arabia - What Jesus Started, p117. We should look to Paul as an example of zealous patience. From the moment of his conversion, he was told his purpose. But you’ll see in Acts that it was more than ten years before his first missionary journey. In the interim, he spent three formative years in Arabia, time in his home city of Tarsus, and finally a season at the church in Antioch until he was sent out with Barnabas. This is Paul, mind you, who at conversion already had an immense knowledge of the Scriptures. It appears Paul did not begin his mission in earnest until he was sent by his “home” church of Antioch at the Holy Spirit’s leading through the elders and congregation. It seems the apostle Paul sat around for a decade before obeying Christ’s missionary calling. Or did he? Think about what you know of Paul. He’s just encountered the Risen Christ on the Damascus Road who commissions him to take the gospel to the Jews and the Gentiles. This is a man of action. He waits 10 years before obeying Christ’s call! Paul tells us that he began preaching the gospel immediately in the synagogues of Damascus. Opposition grew, and Paul grew increasingly powerful. Paul traveled to nearby Arabia to continue his missionary work (Gal 1:15-17). There is no evidence for the popular belief that Paul spent three years in quiet contemplation in the Arabian desert; Arabia was not all sand. It included the area of the modern country of Jordan and was home to the Nabatean kingdom, a flourishing civilization with cities, seaports and farming land. In cities such as Petra there were synagogues where Paul could meet fellow Jews and local Gentiles who were attracted to the God of Israel. Through these Gentiles the gospel could have spread to the surrounding community. When he had completed his mission in Arabia, Paul returned to Damascus where the representative of King Aretas of the Nabateans tried to have Paul arrested (2 Cor 11:32-33). Paul’s mission in the cities of Arabia had stirred up trouble. Paul related his Arabian mission closely with his call to preach Christ among the Gentiles. He told the Galatians he began to discharge this call before he went up to Jerusalem to see the apostles. Therefore no one could say that any human authority, including the Twelve, commissioned him as an apostle to the Gentiles. Paul Barnett, Paul: Missionary of Jesus (Grand Rapids: Eerdmans, 2008), 80-82. F. F. Bruce, Paul: Apostle of the Free Spirit, rev. ed. (Exeter, U.K.: Paternoster, 1980), 81-82. Wayne A. Meeks, The First Urban Christians: The Social World of the Apostle Paul (New Haven, Conn.: Yale University Press, 1983), 9-11. Eckhard J. Schnabel, Early Christian Mission, Vol. 1, Jesus and the Twelve (Downers Grove, Ill.: IVP Academic, 2004), 1031-45. So next time someone says you’re unqualified to be a missionary, remember the example of Paul. He was obedient to Christ’s call.